Centrum Analiz Branzowych (CAB) is a construction market research agency. We offer research of building materials, especially windows, doors, tiles in Poland and other European countries. Our clients are producers of building materials, suppliers, distributors, financial institutions, consulting agencies and associations. European window and door market 2018 is a report addressed to managers of enterprises operating in the window and door industry in Europe. This study is aimed to provide manufacturers of windows and doors as well as suppliers of profiles, fittings, glass units, machines, coatings, etc. with the information about the window and door manufacturing volume in individual countries, the material structure, the activity of enterprises from outside the region in sales on the European market. The report presents also the turnover generated by the leading window manufacturers in Europe. The report "Paving market in Poland, 2018 edition" was prepared by Centrum Analiz Branżowych in order to provide comprehensive information about the development of the Polish industry home and abroad to managers of enterprises manufacturing pavers, supplying materials for manufacturing, and distributors. 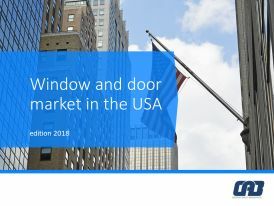 The Report on the Window and Door Market in the USA, Edition 2018, is addressed to managers of window and door manufacturers which operate on or intend to enter the US market as well as to management staff of suppliers of materials for window and door manufacturing, which are planning to develop in the United States.The report delivers comprehensive information about the development of the American window and door sector. Window market in Poland, edition 2018 is the annual report on the window market in Poland. 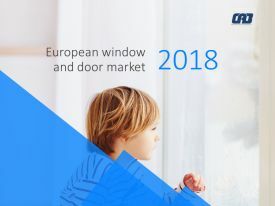 The report discusses the 2017 performance of the window sector and presents a window export and sales forecast for 2018-2019 in Poland. The primary aim of the study was to obtain information about the size and structure of the Polish roller shutter industry and to determine the size of the leading manufacturers. The report also presents data on the automation degree of roller shutters, a roller shutter price analysis, and preferences of the project owners purchasing roller shutters. The report titled „Ceramic tile market in Germany 2018 edition" is a study by Centrum Analiz Branżowych addressed to manufacturers, importers and distributors of ceramic tiles in Germany and other European conutries. This study discusses the results of business activities pursued by enterprises operating in the ceramic tiles industry in Germany. 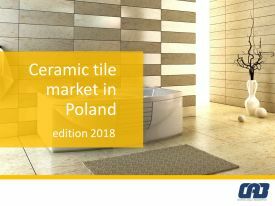 The report titled „Ceramic tile market in Poland 2018 edition" is a study by Centrum Analiz Branżowych addressed to manufacturers, importers and distributors of ceramic tiles in Poland and other European conutries. This study discusses the results of business activities pursued by enterprises operating in the ceramic tiles industry in Poland. The document discusses the performance of the insulating glass unit industry in 2018. The report consists of 4 chapters demonstrating insulating glass unit manufacturing, export, import and sales in Poland. The report on the glass facade market in Poland, edition 2016, is aimed at providing managers of facade enterprises and their suppliers with up-to-date information about the Polish glass facade industry. The report presents the most significant data regarding the volume and structure of the Polish facade industry as well as the results achieved by the leading facade companies.